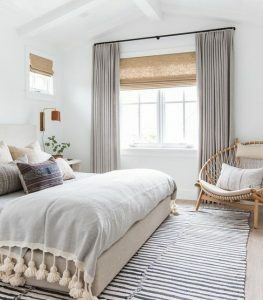 Area Rugs: Rugs act as a base, it’s the canvas for your bedroom. 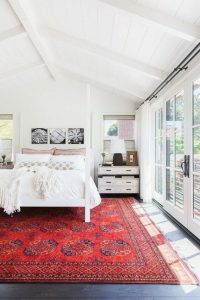 Even if you have a carpeted bedroom floor, adding an area rug anchors the room and allows you to add more personality to the room without affecting the space. Window Curtains: Especially if you’re a renter and can’t fancy up your window trims, a beautiful curtain will do just the trick! Create the illusion of elongated floor to ceiling windows by putting the curtain rod not directly on top of the window, but a few inches below the ceiling. The curtain has to be long enough that it barely touches the ground. 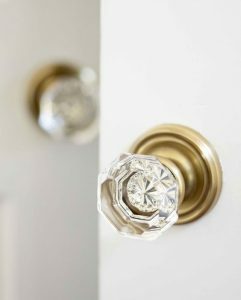 Door Knobs: It’s a small touch of design, but it makes a big difference. Changing out your closet doorknobs, or even your dresser knobs, can adds a personal touch to your bedroom oasis. 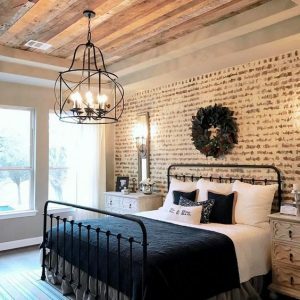 Ceiling Light Fixtures: Tossing and turning in the middle of the night? Your ceiling is probably the last thing you see before shut eye, so jazz it up with an elegant ceiling light. 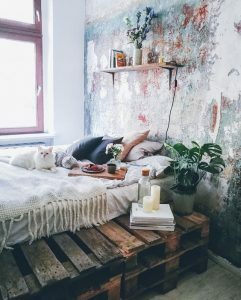 It adds charm to your bedroom throughout the day and night. Need to start with new bedroom furniture? Come visit us at Rockridge Furniture & Design for all your bedroom needs, from area rugs to nightstands, dressers, headboards, and more!